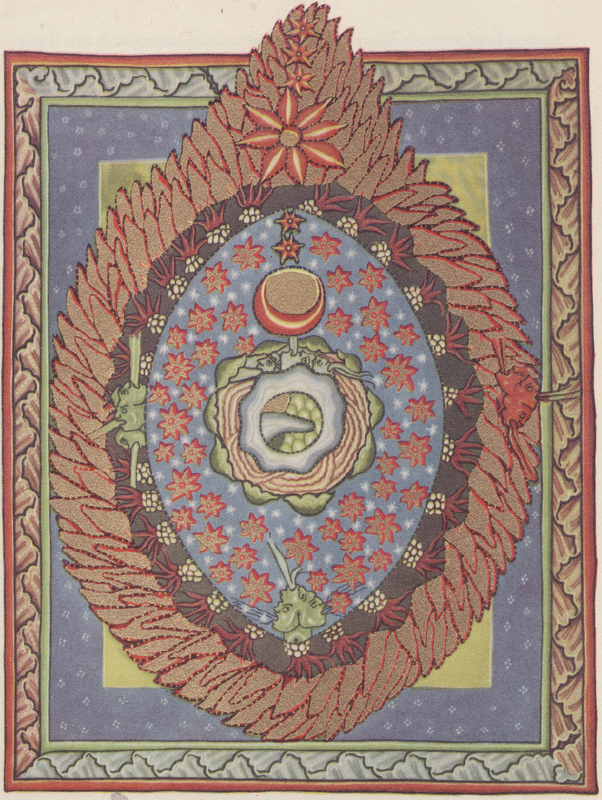 Hildegard von Bingen’s Scivias (short for “Scito vias Domini,” or “Know the Ways of the Lord”) is, as the title suggests, mostly comprised of various divinely-ordained rules for life, with an emphasis on potential social deviancy. 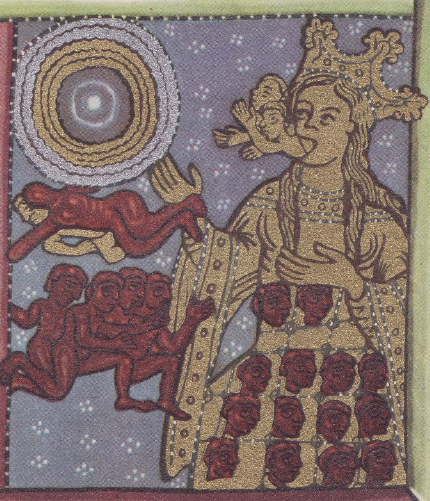 In a manner reminiscent of the Book of Revelation (or even the Quran), Hildegard describes a particular vision (remarkable for their unusually abstract nature), and then recounts the words of God’s direct speech explaining the meanings of each vision to Hildegard. This is especially fascinating since I’m not aware of similarly lengthy medieval texts purported to contain God’s direct speech that were accepted by both Papal and political authority. Her visions are depicted by illuminations (the making of which she oversaw) that are arguably some of the most beautiful and haunting art to be produced anywhere in Europe during this period (~1150 CE). 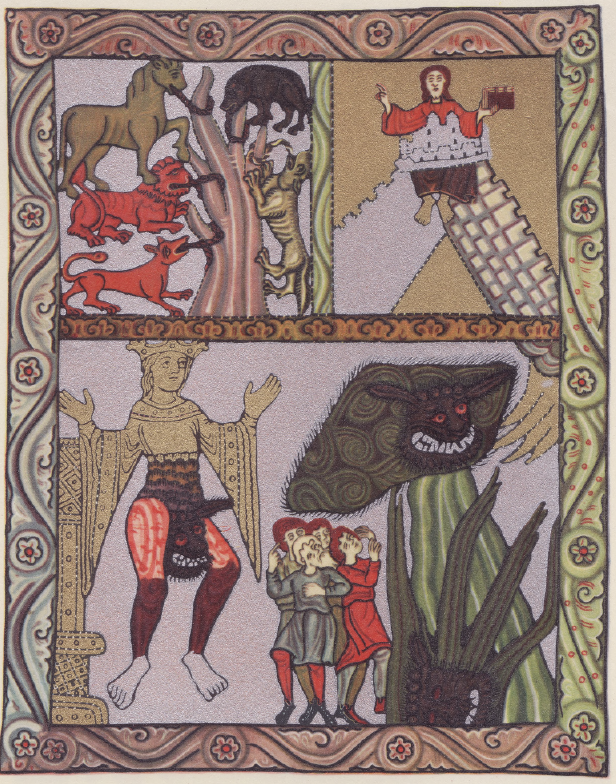 The images below are from a 1954 German language edition in which the only surviving Liber Scivias facsimile was reproduced in full. 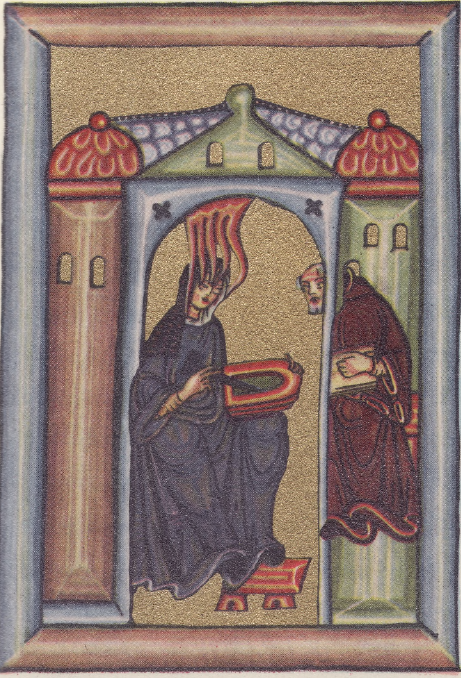 Hildegard, with Pentecost flames, holds a stylus and tablet, relating a vision to her scribe, the monk Volmar. In another illustrative example, God forbids straying from gender restrictions on clothing; Book II. Vision 6.77: Men and women should not wear each other’s clothes except in necessity. “A man should never put on feminine dress or a woman use male attire, so that their roles may remain distinct, the man displaying manly strength and the woman womanly weakness; for this was so ordered by Me when the human race began. 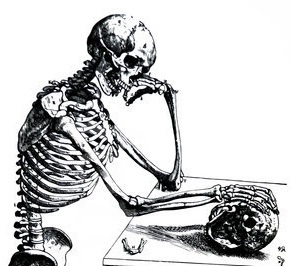 Unless a man’s life or a woman’s chastity is in danger; in such an hour a man may change his dress for a woman’s or a woman for a man’s, if they do it humbly in fear of death. And when they seek My mercy for this deed they shall find it, because they did it not in boldness but in danger of their safety, But as a woman should not wear a man’s clothes, she should also not approach the office of My altar, for she should not take on a masculine role either in her hair or in her attire.” Hildegard’s words on this subject aren’t trivial: nearly 300 years later, the only heresy charge of which Joan of Arc would be convicted was cross-dressing. It was enough to warrant her being burned alive. Most of the text reads like this, though Hildegard (through what are purportedly God’s direct words) also seeks to expound and justify existing church doctrine, as well as to address apparent contradictions. This is aided by judicious use of excerpts from the Old Testament. Recent decades have seen a resurgence of popular interest in Hildegard von Bingen, perhaps due mostly to the modern New Age movement. I humbly suggest that anyone who thinks Hildegard’s brand of mysticism fits neatly into the New Age pastiche might be disabused of this notion if they took the time to read Hildegard’s actual literary works written in her own words. Hildegard was a woman who was arguably one of the most creative and productive intellectuals of her time (her creative output includes decades’ worth of books, letters, poems, and songs), a period in which a deeply, unabashedly patriarchal society held women to be something almost less than human. Yet, whatever her value as an inspirational feminist figure, those looking for an anti-patriarchal hero will find little to admire in Hildegard’s plainly abhorrent and backward views of women and gender roles. Like almost everyone that’s ever lived, she was a person firmly embedded in the culture of her time and place. When appreciated for historical rather than spiritual insight, when taken on her terms rather than ours, the value of Hildegard’s work nevertheless remains for those interested in the past. They’ll find that, beyond the beautiful, hypnotic illuminations, Scivias offers a relatively concise and readable glimpse into the prevailing cultural and spiritual/religious values of medieval Western Europe.